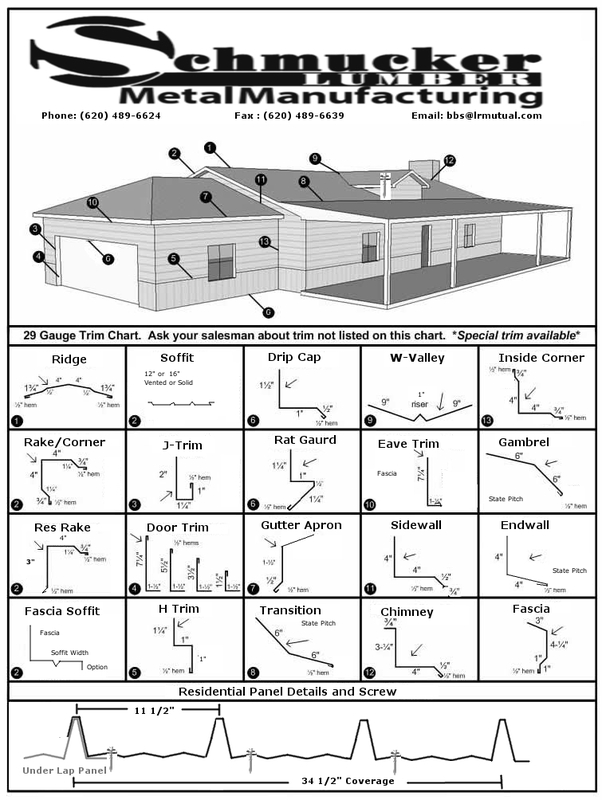 Schmucker Lumber fabricates all metal roofing trim accessories needed for proper installation of metal roofing & metal siding systems. With a computerized trim folder and our preformed break machines, possibilities are unlimited for trim and flashing designs to fit any need. Custom made metal trim to fit any job specification for commercial or residential is our specialty. All trims are manufactured in all colors and galvalume. Unlike our competitors we can fabricate custom trims in lengths shorter or longer than the standard 10’2″. 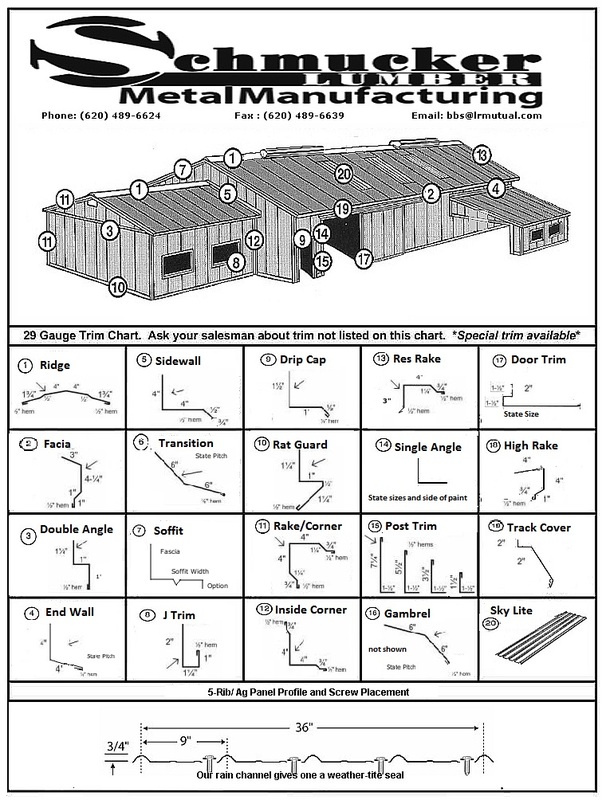 View Trim & Flashings Examples and Trim Profiles for agricultural, commercial, & residential buildings. • Wood screws with the combination metal and neoprene washers should be installed in the flat area of the panel adjacent to the ribs, and tightened such that the washer is compressed evenly and not over-driven. This will ensure a lasting, leak-proof seal. • Vented Closure System – Continuous Ridge Vent allows the metal and roof to breath as well as prevents, bees, insects, snakes, etc., from entering the roof area and allowing a maximum amount of fresh air circulation through the eave and ridge. These are placed at the top of the roof panel under the ridgecap. Totally concealed low profile system. Pipe flashings designed for metal roofing applications in sizes from 1/4″ up to 13″. The stepped-cone design makes it easily adaptable to most roof pitches. Roll insulation for metal roofing, post frame, & metal building applications. Reduces heat gain and improves comfort. Polycarbonate Panels. Virtually Unbreakable! Guaranteed to Retain Clarity and Resist Yellowing. Available in 8′,10′ and 12′ Panel Lengths. Lightweight and easy to install. Class A fire resistance rating. Up to 20 times greater impact resistance than corrugated fiberglass panels. High- Performance to stand up to the most punishing applications. Designed to fit the 5-Rib Panel system. Complete line of parts for Track Door Systems including, top rail, bottom rail, guide rail, “H” vertical rail, door keeper and stop, center guide, side mount track, cover bracket, splice collar, door pull, center latch, jamb latch with strike, end plug, trolley hanger with roller and more. QUESTIONS ABOUT TRIM? CONTACT OUR EXPERTS TO HELP.